The eponymous Good People that inhabit David Lindsay-Abaire’s latest play are far more multi-faceted than this seemingly simple tag would imply. Possibly even more emotionally complex than his last play, Pulitzer-winner Rabbit Hole, Good People presents an audience with a story that seems predictable enough to start but ultimately leaves us in the thrall of its tantalizing ability to keep us on our toes. Oscar winner Frances McDormand is Margaret (everyone calls her “Margie” with a hard “G”). Though a number of her high school classmates, including ex-boyfriend Mike (Tate Donovan) have escaped from South Boston’s Lower End (“Southie” for short), she’s what you’d call a “lifer,” one who was never quite lucky enough or privileged enough to get out. Instead of moving away, she’s been left to take care of her premature, retarded adult daughter Joyce; she’s fired from her job at a dollar store in the play’s first scene after coming late because of the babysitter. And so, after losing her job, Margie is left to commiserate with her friend Jean (“the mouthie from Southie,” Becky Ann Baker) and her eccentric landlord Dottie (the always-funny Estelle Parsons), who spends much of her time constructing decorative bunnies to sell at bingo nights. The solution to her unemployment comes when Jean reveals that Mike, Margie’s old boyfriend, is back in town. He’s a doctor now, and though she can’t quite conceive of what job he might have for her, Margie is intent on broaching the subject. She leaves a message with his office and, when she doesn’t hear back, decides to visit for herself and talk her way into something — anything, so long as it pays. It’s thanks to Frances McDormand’s impeccable performance as Margie that what follows is so captivating. In her every physicality, her gestures and facial expectations, we get the sense that she’s calculating her next move, and it’s thrilling to watch. When Mike tells her there aren’t any job openings, she sets him off by calling him “lace curtains” (a fancy-pants, essentially) and, immediately after, is invited to his birthday party the coming weekend, where, he says, at least one of his friends or acquaintances might know of a job. When the party is canceled (Mike’s daughter is sick), Margie decides to show up anyway, and it’s this choice that sets the play rocketing toward its stellar conclusion. Lindsay-Abaire takes his time setting up the play’s themes of class versus integrity and fate versus luck, first establishing apparent truths, then subsequently turning them on their heads. It’s exactly this quality that makes Good People so thrilling to watch. 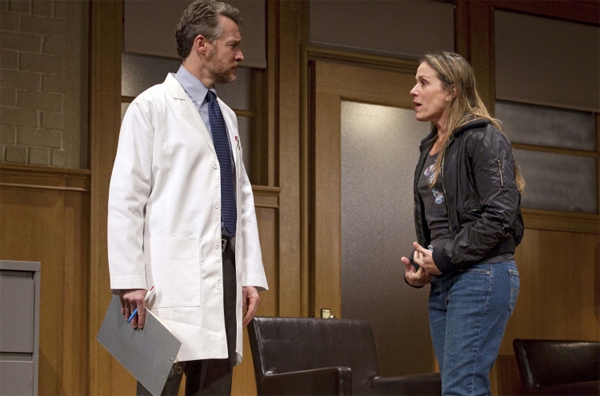 Besides for McDormand’s top-notch performance, Tate Donovan is also excellent as Mike, particularly when Margie begins to let out her Southie secrets about his mean streak, inverting his character’s hitherto docile demeanor. Renee Elise Goldsberry, as Mike’s wife Kate, succeeds in part because her age and race (she’s much younger than Mike and black) are at once entirely relevant and totally irrelevant within the context of the play; she’s essentially the control against which the play’s conflict struggles. Good People, because of its craft and skilled performances, seems destined to be one of the plays to watch at this years Tony Awards. Directed with emotional precision and physical agility by Daniel Sullivan, the play is aided particularly by quick-change rotating sets by John Lee Beatty that ensure there is never a dull moment from start to finish. If these good people aren’t always as good as they seem, what makes them worth watching is their capacity to vacillate between goodness and unkindness at the drop of hat. As a consequence good people make for great characters, and this play makes for a wild ride.